“The eyes are the window of the soul." They are the first feature that people notice about you. At Burien Medical Eye Care LLC, providing you a caring, compassionate and satisfactory experience is our #1 goal. Why Choose Burien Medical Eye Care LLC? For nearly three decades, our office has been treating common or complicated eye disease, as well as disorders of the eyelids. If you have droopy eyelids, puffiness and bags under the eyes or you have had multiple previous failed eyelid surgeries, we look forward to the opportunity to discuss your concerns, present options, and to work with you toward managing your medical eye problems and satisfying your aesthetic goals. At Burien Medical Eye Care LLC, we will assist you in making the right decision. Cosmetic and reconstructive eyelid surgery is provided with the utmost convenience and very rapid recovery. No-stitch lower eyelid blepharoplasty requires only a single office visit. State-of-the-art diagnostics for glaucoma, cataracts, macular degeneration, and diabetes in the eye. 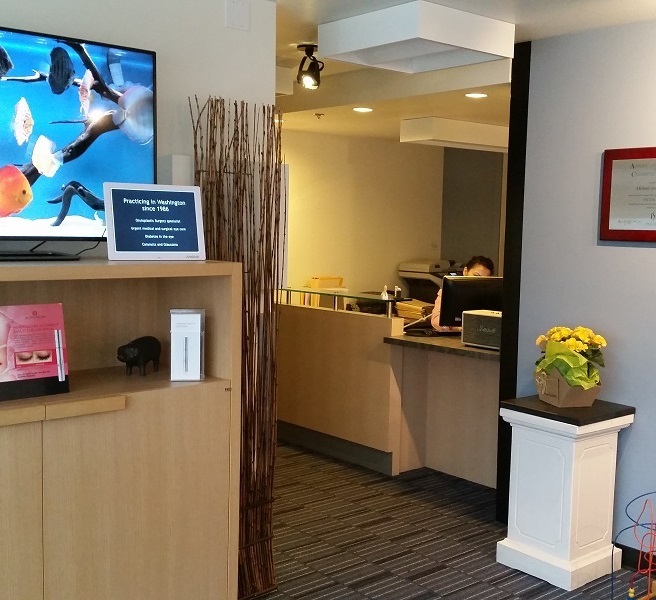 The reception area reflects our goal to provide a comfortable and compassionate experience for our guests. Latte while you wait?